Pls. call above No. to confirm before you go. We are the third Church which has English Mass after Hangzhou and Ningbo Church. 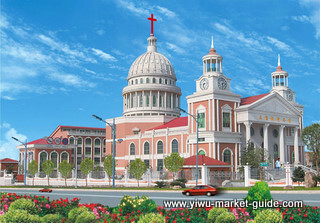 In 2001, with the development of the market in Yiwu, trading company set up by Muslim countries reached more than 20. In the same year, the Provincial Ethnic and Religious Affairs Commission approved the first place for Islam in the temporary activities - Red House Hotel. 2002 Spring Canton Fair, the number of poly Boxing Day has reached 500 people, the Red House Hotel's premises was only 150 square meters, and there is a big security risk. Municipal government attaches great importance to the original place in the Red House Hotel successfully relocated to the south gate Street 200, second floor, with an area of about 500 square meters. 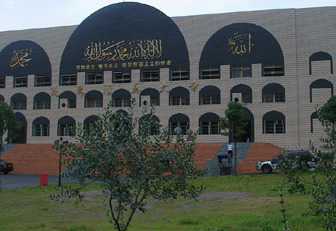 In the same year in September, to ensure that the majority of foreign Muslims in Yiwu have a good religious life, according to actual needs, the city of Yiwu City Bureau of Religious Affairs approved the establishment of Islamic places of temporary management committee. October 2003, the Canton Fair, Yiwu Fair during the Friday Prayers number has increased to more than 1,500 people, at that time, "the Beijing Youth Daily", "Global Times", "China Today" and so with a larger coverage and presentation of business life in Yiwu, Yiwu, Muslim and "Arab village." Major domestic websites have also reproduced the reports at home and abroad. April 2004, during the trade fair, South Gate Street, another place where overcrowding has reached more than 2,000 people, the municipal government attaches great importance, they began to find the right place.